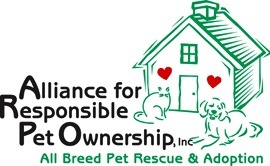 The Alliance for Responsible Pet Ownership, Inc. was conceived in 1998 by a group of Indianapolis citizens concerned about the continuing high rate of euthanasia in our city. ARPO seeks to unite animal-related businesses and organizations in central Indiana for the purpose of promoting responsible pet ownership and decreasing the number of companion animals surrendered to shelters. ARPO is funded solely by donations and is staffed entirely by volunteers. We do not have a shelter, so all of our adoptable animals are housed in temporary foster homes until loving permanent homes are found. If you would like more information on becoming a foster parent, please contact us.